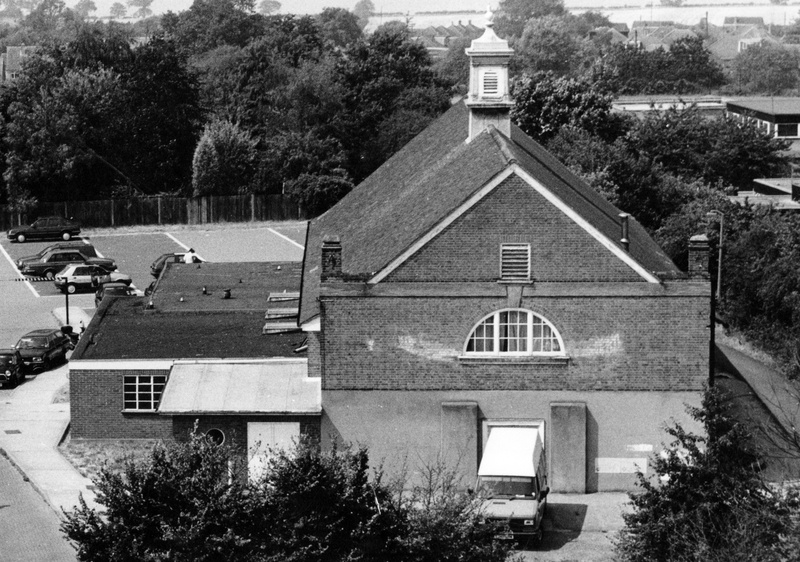 The Archer Hall was built just before the Second World War in Laindon Road where Emanuel Church now stands. For over 50-years it was the main entertainment centre for the town. A highlight for the year used to be a Christmas pantomime performed by some of the town’s characters. Many other events were held there including dances, plays and amateur operetta; while Chris Barber presented a jazz concert there in the 1970s. Daytime activities included antique fairs and retail sales. A kitchen was added to the rear of the building during the war to provide meals for soldiers billeted in the town. Several single story annexes were also added, shown on the left of this picture. The first provided dining facilities for the soldiers. The lantern in the centre of the roof carried a weathervane, already removed in this picture. A soldier took a pop-shot at it in the war. When the building was demolished, in the late 1990s, it was found to have a bullet hole. A firefighter wondering why I was hanging around in front of the fire station with a camera asked ‘Can I help you?’ I explained that the Archer Hall was due to be demolished and I was looking for the best place to take a photograph. My suggestion that I could get its best view from the station practice tower met with the response ‘far too dangerous for access by the public’. However if I left my camera with him he would take a picture for me. He was a good as his word and returned my camera the following week. I finished the film, no digital in those days, and his resulting picture is shown here. For several Saturdays just before it closed it was hired by a tool retailer. He suspended an advertising banner across the front the building that left a mark that remained until it was demolished. I used to go to the youth club held in the annex during the late sixties. It was run by David at the time. Happy memories. Some names: Bernie Cooper, Alan Fisher, Timothy Doyland, Hazel Tooze, Biddy…….. In the run up to the 1970 General Election, I attended a rally there. Bob McCrindle, the new MP for Billericay spoke to a full house and to add some gravity to the meeting, he was supported by Lord Hailsham, otherwise known as Quentin Hogg, who came on stage waving his stick about!